April is National Poetry Month, so throughout the month, Milwaukee Public Schools is highlighting the district’s talented poets. 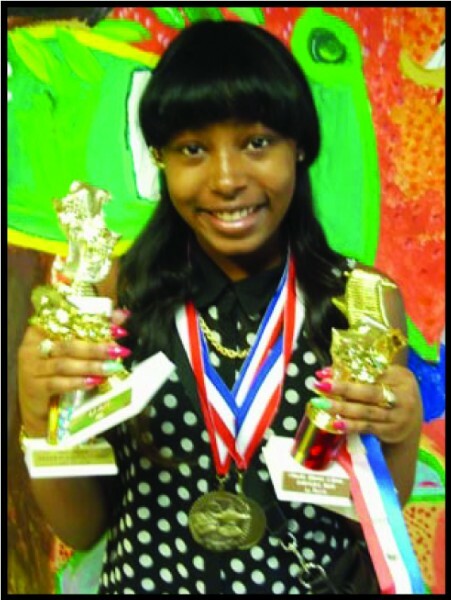 Clement Avenue School eighth-grader Taijahna Lee-Seamster took first place overall in the poetry category at the Middle School State Forensics Tournament, held March 23 in Neenah, WI. Tijahna read her original poetry, powerful accounts of the experiences and impressions from her life. In writing her poems, Taijahna demonstrated exceptional literacy by using precise words and phrases, relevant descriptive details and sensory language to capture the action and convey experiences and events, as detailed in the Common Core State Standards. Forensics is a free, middle- and high-school extracurricular program offered at 20 MPS schools. After teams are formed each fall in October, students rehearse from November through January and then compete in meets in late January through April. Attendance at all meets is not required, but students must meet with their coach at least once a week. That’s the definition that many people choose to abide by, but you see I see things differently which is why, when I write I FLOW just like the deep blue seas in AFRICA. The Unexplainable beauty of the brown flesh of us. THE COLORED GIRLS. Our Nappy Hair Mahogany skin, brown eyes and curves. Curves, like swerves on a twisted street. The creators of what you call dancing to the beat. WE ARE BEAUTY. We define what you consider beautiful. Even though in your mind it may be inconsiderable that someone with hair like mine, skin like mine, and curves like mine… just can’t be considered beautiful. But your thoughts mean nothing to me; I know that my skin is a flaw that often draws attention to me. And as you can see as well as I can, there is nothing wrong with THE SKIN IM IN. I am truly blessed with the gift that god has given to me. My skin signifies, strength, power and will. Even though for centuries my people have had to climb on what feels like the highest towers just to earn your respect and equal rights. I will not let that affect me. I stand tall with my brown skin, it is here for the world to see, and I will happily agree with anyone that says that brown signifies, beauty. Many people may not believe but many will. It’s nothing new, it’s been happening for years and many more years to come. History will continue to repeat, and as long as my heart beats I will always believe, that there is nothing wrong with THE SKIN I’M IN.